At the front of the wrist is a tight tunnel, The Carpal Tunnel, through which the flexor tendons and the median nerve pass into the hand. The floor of this tunnel is made by the wrist bones and the roof by a tough ligament. 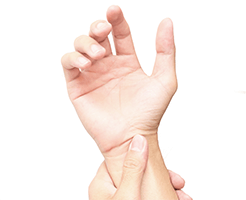 Carpal Tunnel Syndrome (CTS) is when the median nerve is compressed in the tunnel. The median nerve supplies some of the muscles that work the thumb, as well as sensation to the thumb, index, middle and half of the ring fingers. Symptoms of CTS are typically pins and needles and tingling or numbness in the above 3 ½ fingers. There may be discomfort and pain in the hand which may also radiate up the forearm. There may also be weakness of the thumb that may interfere with hand function. Often patients complain of waking up at nights with these symptoms and need to shake their hands to get relief. In its most severe forms the muscle at the base of the thumb may even be wasted. Mild carpal tunnel syndrome is usually managed by non-surgical means initially. Some of these include splinting to rest the wrist and stop it from bending especially at night. Others include weight loss, fluid loss, activity modification and steroid injection into the carpal tunnel. Moderate to severe CTS usually requires surgery (carpal tunnel release) to decompress the carpal tunnel and relieve the pressure on the median nerve. This is done by dividing the tough ligament that forms the roof of the carpal tunnel (the transverse carpal ligament) and creating more space in the tunnel. Hand Surgery is one of Dr Safvat’s interest and area of expertise. Carpal tunnel release (CTR) can be done as an open operation or with a telescope (endoscopically). Dr Safvat has been trained in both methods but prefers to do it via an open method as the very small benefits of the endoscopic procedure is not worth the increased risks of complications associated with it. CTR is performed in an accredited hospital, usually under a short general anaesthetic but can also be done under local anaesthetic. The procedure is done as a day only procedure without the need to stay overnight in hospital. The hand and wrist is usually wrapped in a bulky bandage and patients are discharged with a sling to elevate their hands. Finger movement is possible but wrist movement is usually restricted. The dressing needs to stay dry and intact for one to two weeks when Dr Safvat will remove them. He will then give his patients exercises to do after this time. The sutures are dissolvable and will fall out by themselves with some scar massage. Usually Pain and the night symptoms resolves fairly immediately after the surgery but the numbness and thumb weakness may take up to 12 months, depending on the extent of damage to the nerve prior to the surgery. Wasting of the thumb muscles may never recover. All operations have risks and Dr Safvat will discuss these in details with his patients beforehand. CTR operation does not cure every one. There is about 10% chance of not improving after the surgery. This is often the result of wrong diagnosis. Dr Safvat insists that all his patients have a Nerve Conduction Study before the operation. This not only confirms the diagnosis but can also be used as an objective measurement to gauge Median nerve recovery after the CTR. There is 1 hour street parking on “Majors Bay Road”, or on Trafalgar Parade at the adjacent Street. There is limited 1 hour street parking on “ Kingsway”. Alternatively, parking can be obtained in Westfield Miranda (no charge for the first 3 hours) which is across the road from our building. The best parking entrance to use is the “Jackson Avenue” entrance which is a short 3-5 minutes walk from our building. For your convenience, there is a drop off area outside our building where patients with limited mobility are able to be dropped off.